PerfCap Corporation, the leading provider of automated performance management and capacity planning software for the IT industry, today announced CloudView Starter Pack, an easy and cost effective way for customers to begin the performance monitoring and capacity planning of their VMware computing infrastructure. The CloudView Starter Pack includes a 30 day free trial of our software and within 90 days, the option to purchase CloudView software including one year support at a significant savings. 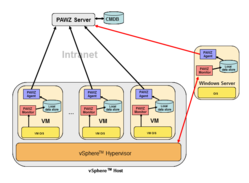 This limited time offer includes five VMware client licenses at the regular price and the Performance Analysis Web Zone (PAWZ) Server at no cost. CloudView simplifies the effort of managing the performance of computer systems and applications in todays distributed computing environment. Using agent-less collector technology for VMware, CloudView provides realistic capacity planning, going beyond the simple trending projections to forecast actual system responsiveness based upon sophisticated algorithms that reflect end-user satisfaction. CloudView enables managers to visualize the performance, capacity and risk status of all of their servers and applications in a single view. Using CloudView managers know exactly what servers can handle additional loads so they can more effectively provision their infrastructure avoiding the need to purchase unnecessary hardware. And, CloudView can easily scale to manage even the largest enterprise-class computing infrastructures of tens of thousands of servers. The CloudView Starter Pack gives IT organizations the ability to quickly and cost effectively begin visualizing and optimizing the performance of their computing infrastructure, said Prem Sinha, CEO of PerfCap. Now customers can experience the benefits of our software even on a limited budget. For details on the CloudView Starter Pack and to download the trial software please go to http://www.PerfCap.com. PerfCap Corporation, formed in July 2001 by experts in performance management and capacity planning, is headquartered in Nashua, NH, USA. A privately held company, PerfCap continues to focus on the development, deployment, and support of world-class performance management, capacity planning and asset management software for open system environments. PerfCap Corporation provides the banking, stock exchange, technology, pharmaceutical, semiconductor, medical insurance, education, and defense industries with next-generation performance management and capacity planning solutions.